Lyle Eckman spent the better part of 3 decades teaching marksmanship and firearm safety to the young people of eastern Washington. I spent about 15 years working with him as a part of the NRA Junior Marksmanship Program. He loved working with the kids and was an outstanding teacher. He was also a lifelong shooter -- a Master class rifleman, and an Expert bullseye (handgun) shooter. He served in the US Navy aboard the USS Enterprise in Viet Nam. He was a gentle soul with strongly held opinions on what combat weapons should (and should not) be. He had a definite warm spot in his heart for the M1A, the M1 Garand, and the Colt 1911. A fan of Jeff Cooper, when the 10mm cartridge came to be, Lyle recognized that it’s combination of higher velocity, flatter trajectory, and adequate bullet weight/diameter generated greater effective range, making it a more effective combat weapon and extracting the most power that could be sensibly squeezed from the 1911 platform. When Colt brought out the 10mm in the 1911A1 platform in the Delta Elite in the late 1980s, he bought a 5” blued model. He shot the gun a modest amount for familiarity and function, but not a lot. Mostly, it was a “just in case” gun, an optimum tool kept in prime condition and ready to go on a moment’s notice, with a healthy supply of ammo on hand. Lyle always had a twinkle in his eye when he spoke of this gun; it was clearly very special to him. 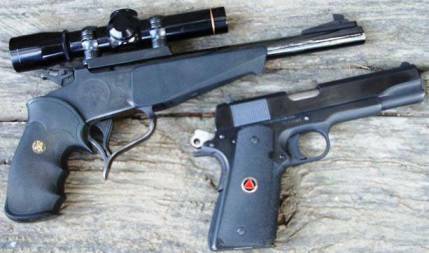 In the early 90s, Thompson-Center Association had a run of 10” TC barrels chambered for the 10mm made available to members. These carried very friendly price tags and I bought one for a re-chambering project (.40-50 Sharps Straight). Knowing his fondness for the 10mm, I told Lyle about this and he lit up like a Christmas tree, so I bought a second one and gave it to him as a gift. Lyle died in October 2010 after a long, tough-willed fight with cancer. As we were going through his guns I found the 10mm TC barrel, still in the box. The Colt Delta Elite was clean and oiled and ready to rock-n-roll (complete with 2 spare magazines). Remembering his fondness for the 10mm, I decided to give these two a home in an effort to keep a portion of my friend’s legacy alive and to preserve that “twinkle”. I have worked with the 10mm cartridge a little bit before in the S&W 610 platform, and have a good feel for what it is capable of. While not necessarily an ideal handgun hunting cartridge, when properly loaded it is capable of performing admirably on small and medium game. My goal was to develop a good cast HP load for the 10mm that would be an effective hunting load. I wanted to get as much bullet mass as possible that would still allow me to get velocities 1100+ fps to insure positive HP expansion. I looked through my mould box and found a 2-cavity RCBS 10MM-200-SWC mould that I knew from previous experience cast a good bullet that shot well in the S&W 610 10mm. Generally speaking, it is possible to push 200 grain bullets as much as 1200 fps (or more) from the 10mm, so I figured that 1100 fps or so would give me what I was looking for -- good power, good expansion and not beat up the Colt over time. I packaged the RCBS mould up and sent it off to Erik Ohlen of Hollow Point Bullet Mold Service; erik@hollowpointmold.com; (541) 738-2479), with instructions to perform his “inset bar conversion” to make a 2-cavity HP mould, with .110” cavities that were .325” deep, with a 7 degree taper and rounded HP pin tips. The mould was returned a couple of weeks later with the Ohlen 2-cavity HP conversion exactly as I had requested. Erik sure does beautiful work! 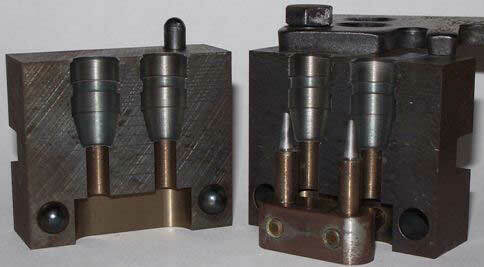 RCBS 10MM-200-SWC mould converted to Eckman HP. I mounted the mould onto a pair of handles and fired up the lead pot. The mould cast very nicely, and created quite a pile of bullets in no time! I didn’t actually time myself this particular casting session, but with similar 2-cavity HP moulds I have no problem casting 5-6 HP’s a minute, and this mould felt like it was casting at the same cadence as those other moulds. 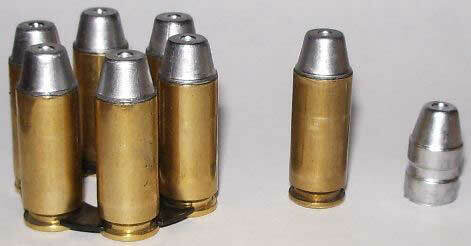 These bullets were cast with recovered range scrap (BHN measured at 9-10), and they dropped from the blocks weighing 204 grains and .402” diameter. Lyle really liked the 10mm cartridge, and he would have really liked this bullet in the 10mm, so it only seems appropriate to name this design in his memory -- this is the “Eckman hollow point”. For lighter bullets in the 10mm I generally like to use AA #7 and HS-7, but for 200 grain bullets I have generally gotten superior results using AA #9 and so I tend to gravitate to that powder first when dealing with a new bullet in that weight range. Test loads were tried with HS-6, HS-7, AA #7 and AA #9, and sure enough, the best accuracy was obtained with AA #9. Also learned in these tests was that better groups and more uniform velocities were obtained using the CCI 350 primer instead of a standard large pistol primer. The load I finally settled on for the Eckman HP was 11.5 grains of AA #9, sparked with a CCI 350 Large Pistol Magnum primer, seated to an overall length of 1.25”, and taper crimped. Thus assembled, this lightly compressed load shoots well and feeds reliably in the Delta Elite. This load also shoots well in the 10” Contender and the S&W 610’s that I’ve shot it in (for the S&W 610 and the Delta Elite, this load shot better when the Eckman HP was sized .400”; the T/C Contender preferred it to be sized .401”). This load should be running in the 1100-1150 fps range, depending on barrel length. 10mm loaded rounds & and as cast Eckman HP. Lyle was all about teaching firearm safety and marksmanship to the next generation so they could enjoy the shooting sports safely and responsibly, so it just seemed appropriate to have the first animal taken with the Eckman HP be shot by a member of the younger generation (and one of our former junior shooters). I have known John since he was 4 years old (over 20 years) and have enjoyed hunting with him for the past several years. John has taken several other hogs in recent years, but this would be his first time to hunt hogs with a handgun. I wanted him to start out with a revolver that was known to be accurate, and one that wouldn’t generate any bad habits with excessive recoil and muzzle blast, but would have adequate power to drop a medium-sized meat hog quickly and humanely. The N-framed full-lug S&W 610 chambered in 10mm seemed like a sensible choice, and John’s eyes lit up at the idea of being the first person to take an animal using the Eckman HP. S&W Model 610 10mm, full moon clip, Eckman HP's. Also along for this trip was my long-time hunting partner Kyle, down from Spokane. Kyle has always wanted to shoot a pig, but had never gotten around to doing it. He’s had a really nice Ruger Redhawk .41 Magnum (fitted with a 2x Burris) for years that he just dotes on, and he decided that this sounded like a good opportunity to make some pork with his pet .41. We got settled in to the ranch uneventfully. After a big breakfast the next morning, we got out and found hogs fairly soon. The moon had been out much of the night and they had been feeding in the moonlight, so they were sleeping in, all bunched together, making it difficult for us to get a good look at individuals to pick ones of the size we were looking for. We tried several methods to rouse them (including shouting at them), but had no luck. These hogs were pretty tame and they wanted their beauty sleep. We left to go find a black Hawaiian ram for me. We went all over the ranch looking for a black Hawaiian, including several of the known ram hang-outs -- the big pasture on top, the rocky canyon, the sheep shack, the saddle, etc. -- but never saw any sign of a black Hawaiian. There were supposed to be a couple good black Hawaiian rams on the ranch, but we never saw them. It appeared that the inventory of animals was way down. The larger pastures were showing little sign of being grazed (a first in my experience), so we came back down the hill for lunch, and to re-group for the afternoon hunt. After lunch, we found that the hogs were up and moving about. We were quickly able to identify two good meat hogs for Kyle and John. 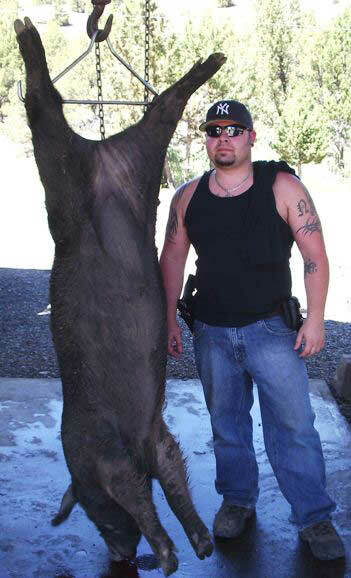 Kyle, having never shot a hog before, was given first shot. He was using Remington factory 210 grain SP ammunition in his Ruger Redhawk .41 Magnum. He placed his shot beautifully -- raking both lungs and perfectly center-punching the heart. The Remington 210 grain SP exited the 300 lb sow. She staggered about 15 feet and fell on her side, with a finger-thick stream of blood squirting 6 feet out of the entry hole. The sow was dead in seconds. Kyle & meat hog taken w/41 Mag. The rest of the herd immediately got excited and scrambled up the hill to lick up some of the fresh blood (as hogs are wont to do). 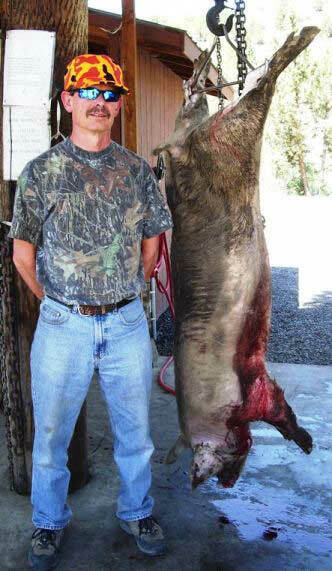 The 300 lb boar that John had picked out stayed clustered up in the herd and just would not give a good shot presentation. Then he wandered down to the water hole/mud wallow and took a bath. During this performance, he scratched himself all over using the bank (he was at this for quite a while, so he must have been pretty itchy). John didn’t want to have to drag him out of that mud wallow, so we sat back and waited for the boar to address all of his itchy spots, and then move up onto the bank to find a spot in the shade. He was most uncooperative about giving a decent shot presentation. Suddenly he stepped out to the side of the herd and turned, giving a clear 20 yard shot and quartering away slightly. John quickly brought the S&W 610 up, drew a bead just behind the right shoulder, about 6” up and fired. I saw the bullet hit, and as the boar scrambled away listing heavily to port, I could see spray emanating from the entrance wound. The boar made it all of about 10 feet and collapsed……. right into the middle of the creek! The Eckman HP had gone just above the heart and had expanded well, shredding both of the lungs, and punched its way into farside (left) shoulder. The black boar died very quickly (and very wet!). John & hog taken w/10mm Eckman HP. We had two firsts in a matter of minutes of one another -- Kyle had his first hog and John had his first handgun kill, and both had been picture-perfect, clean, one-shot kills. We got the two hogs loaded onto Loren’s 4-wheeler trailer, and then we went down to the skinning shed to get them hung up. As the hogs were getting skinned, I was pondering my options. Eventually, I decided to take a Dahl ram, and settled on an old desert tan Dahl that I had seen earlier in the day. I found him with another ram and 5 or 6 Corsican lambs on a partially wooded hillside, about a quarter of a mile from where I had last seen him. I was able to get fairly close, but they all stayed bunched up, even when they were moving, and getting a good clean shot presentation was impossible. 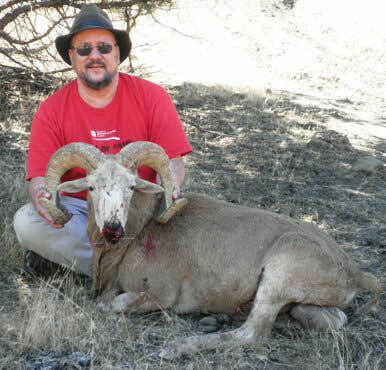 Eventually, the desert tan Dahl ram stepped out to the right of the group, quartering strongly away from me (about 45 degrees, facing my right), at a little over 30 yards and I put the crosshairs on the right rear ribcage, intending to rake the lungs and break the farside (left) shoulder. The 10mm TC put the Eckman HP right where I told it to go, but the ram just trotted off away from me, showing no signs of being hurt. Reviewing the shot, I felt good about the bullet placement, but I was a bit confused about him not going down. I chased him for a couple of minutes, but wasn’t able to get a clear shot (they were staying all bunched up and weaving in and out of the junipers). A couple of times I could make out the entry wound so I knew that bullet went where I had wanted it to go, but he was still on his feet, his head was still up and he was keeping up with the others in his group. Eventually I was able to swing around in front of the group and turn them uphill, and as they swung around above me, I was able to get a clear 20 yard shot on the ram. Once again, this was a quartering away shot from the right, but this time at a much shallower angle (maybe 20-25 degrees). Once again the TC put the 200 grain Eckman HP right where I wanted it to go. This time the ram scrambled off across the slope, with his head hung low and his left front foot dragging. He piled up after about 20 feet, and started rolling slowly down the hill. Closer inspection revealed that the first shot had hit the next to the last rib on the right side and turned 90 degrees to the left, going through the paunch and exiting in the middle of the belly (the exit got plugged with browse and didn‘t bleed at all). A freak occurrence to be sure, but sometimes bullets do strange things. The finisher had entered in the middle of the right side ribcage, expanded very nicely indeed, shredded both lungs, and exited through the left shoulder. We took some pictures and then dragged the ram down the hill to the truck and got him back to the skinning shed. The afternoon was heating up and that cold beer back at the skinning shed sure tasted good! Glen & the Desert Dahl ram. 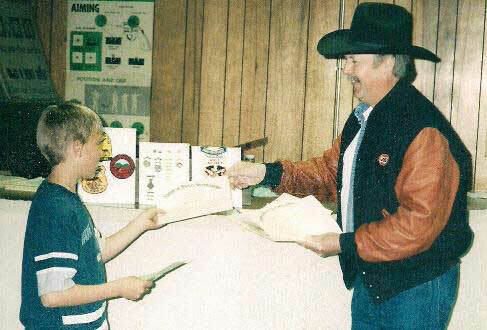 That evening I gave John a little memento to commemorate his first handgun hunt, then we had grilled steaks with sautéed mushrooms and 4-bean salad, and sat around the campfire telling hunting stories until late. Sleep came easily that night! The 200 grain .40 caliber Eckman HP is probably a little on the light side for 300 lb hogs (I generally prefer to have hunting bullets exit, if possible), but it managed to make short work of one as a result of John’s superb shot placement. When I originally envisioned this design, my thinking was aimed more at critters in the 100-250 lb class (deer and antelope and such), and since the 10mm was originally envisioned as a combat round by Col. Jeff Cooper, I think the Eckman HP falls into the good Colonel’s vision quite nicely. While the first shot on the desert Dahl ram behaved oddly, I think that was just a fluke (I have had jacketed bullets turn in similar fashion before), and not due to the bullet design. Certainly, the finisher behaved exactly as expected, expanding beautifully and punching out through the far shoulder after penetrating about 20”. Excellent performance from the 10mm Auto cartridge. I think Lyle would approve.